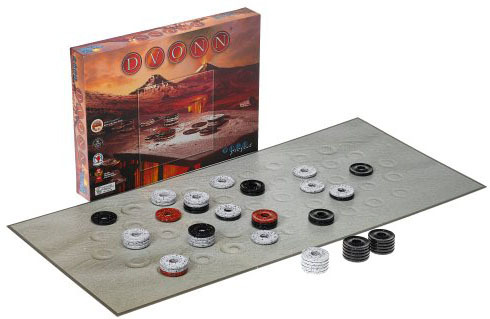 DVONN is a challenging stacking game with very simple rules. It is played with 3 red DVONN pieces, 23 white pieces, and 23 black pieces. The players must try to control as many pieces as possible by building stacks, preferably by jumping on top of their opponent’s pieces. While doing so, pieces and stacks must remain linked to the red DVONN pieces. If not, they are out of the game! When no more moves can be made, each player puts their stacks on top of each other. The player with the highest stack wins the game! GIPF is the first and central game of Project GIPF, a series of 6 games for 2 players. TAMSK is the second game, ZERTZ the t hird, and DVONN the fourth. The Project is a system that makes it possible to combine games - not only the games of the project itself, but any game or challenge. This system is based on the use of potentials. Each game of the project introduces its own new potential into GIPF. If the word GIPF means absolutely nothing to you, then ignore the end of my title and simply believe me when I say that DVONN is one of the best abstract strategy games ever created. It is a joy to play, and a game that will still be entertaining one hundred years from now as gaming trends rise and fall over time. DVONN starts with nothing, then is completely filled with pieces, then works itself back towards nothingness again. Players “build” the board by laying stackable rings onto the spaces provided, taking care to connect themselves to three red “anchor rings”. When all rings are dropped, the game begins and players take turns moving one piece from an outside edge, onto a neighboring piece. This will form a stack. The key is, players can only move pieces or stacks that have their color at the top (this counts as “control”). AND, once a stack has been created, that stack must move an amount of spaces equal to the amount of pieces in the stack. Because pieces must stack and can never move into an open space, the game becomes very tricky as large stacks are created and suddenly can no longer move. And since all pieces must trace a path to one of the three red rings, a big set of points for game end may suddenly become disconnected and removed from the game. When no players can make a legal move, the game is over. All rings are taken from the board and the controlling players stack all their pieces together. The player with the highest stack wins. It’s the swings in gameplay and the variety of movements and options that this creates, which lift DVONN out of the dregs of similar abstract strategy games. There’s no fluff or theme here. This is pure strategy with near infinite possible combinations. The only issue with replayability is the static start once the board is filled. Similar to chess and it’s starting formations that become tedious, the layout can make for some shoulder shrugs when the game begins. Otherwise, this game is extremely solid. It is my 3rd favorite game in the GIPF series (behind YINSH & TZAAR), and easily in my top ten abstract games. I was skeptical of this game at first and felt like I had to make fairly random decisions when playing this game the first few times. However, you really start to see the effects of early decisions later in the game. The game is unpredictable and can get very strategic if played between two people who know the game well. You will understand my love of the game when you control your first Dvonn piece and jump it across the board wiping out half of your opponents stacks!!! Add a Review for "DVONN"